Testo 350 MARITIME Emissions Analyzer | Don Wolf & Associates, Inc.
As air quality regulations become more strict and emission control areas become more prevalent, it's good to have the testo 350-MARITIME as your emission testing solution. Built to meet the demands of maritime conditions, the Testo 350-MARITIME measures O2, CO and NOx more easily and less costly than other methods available. The perfect analyzer to test exhaust gas emissions subject to MARPOL Annex VI and the MEPC.103(49) protocol guidelines. Reference method accuracy at a fraction of the price, all contained, convenient, rugged transport case perfect for testing marine applications. The Testo 350-MARITIME will make your emission testing and reporting quick, easy, and affordable. Years of practical experience in measuring emissions from industrial engines has resulted in a new analyzer designed for the marine industry. High accuracy to meet regulatory requirements. Unsurpassed portability to test anywhere, any time! Intuitive operation for easier testing and data reporting. 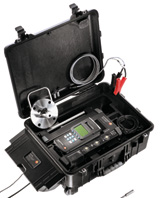 The testo 350-MARITIME is a complete emission analyzer system that accurately measures O2, CO, NOx, and CO2. The sensors, electronics, pumps, sample conditioning system are integrated into a small compact analyzer weighing less than 10 lbs. The testo 350-MARITIME measures O2, CO, CO2 and NOx as a complete integrated emission testing system applicable to the following MARPOL Annex VI requirements. On-board periodic & intermediate surveys using the "Direct Measurement" and "Monitoring" method On-board "Simplified Measurement Method"
Testing doesn't get any easier. Simply put the probe (w/ sintered filter) into the exhaust stack and activate the pump. The emission measurements will quickly be seen on the large back-lit display. For greater testing flexibility, use easyEmission software to control the analyzer, view data in many formats, or print emission reports.